Today we got back on the tour bus that is known as Ye Ole Minivan and booked it on over to Vermont Teddy Bear. What a CUTE tour! Now, you don’t know this but I worked for VT Teddy Bear just this year selling bears for them online. I got the job through a legitimate work from home company called Alpine Access. It was a really fun seasonal job and I got to do it while still in my pjs. Awesome.Selling the bears is how I learned all about them. For instance, they are (seems obvious) made in Vermont, have movable heads, arms and legs, have a ton of customizable options and have a lifetime guarantee (as long as you don’t put them in the dryer, that voids the guarantee). Bears hate dryers. I learned that on the tour when our guide showed us a sad bear with singed, matted dryer hair. We were also able to view other tragic bear accidents on our tour. They’re totally covered by the guarantee though, as long as you can produce a tag or an eyeball, you’re covered. Sounds sick and demented, but is true. The eyeball of a VT Teddy Bear says VT Teddy Bear in it. Creepy? Maybe. I can tell you I’d be sending in an eyeball and a note if anything severe happened to mine. I got my first VT Teddy Bear as a gift from them for working for them. What an awesome company and how smart. Of course I turned right around and spent a bunch of money buying DH a black belt martial arts bear for his birthday. (This is a total deviation of my normal course. I am she-who-refuses-the-cutesy.) I halt my cutesy ban when it comes to these bears though. I even gave one to my Mom (who got her Master’s degree in her 60’s…how awesome is that?) for her graduation. It was wearing a grad gown and hat and I had it embroidered with all her info. It was a hit. So, I say all this to explain that…I bought 3 cub bears just for myself to go with DH’s bear and my bear at home. My cubs even have my kids names embroidered on them. Ahh, the cuteness…never mind the ban on cute…I’ll act like they are serious so no one will think I’ve let my guard down or am mellowing in any way. 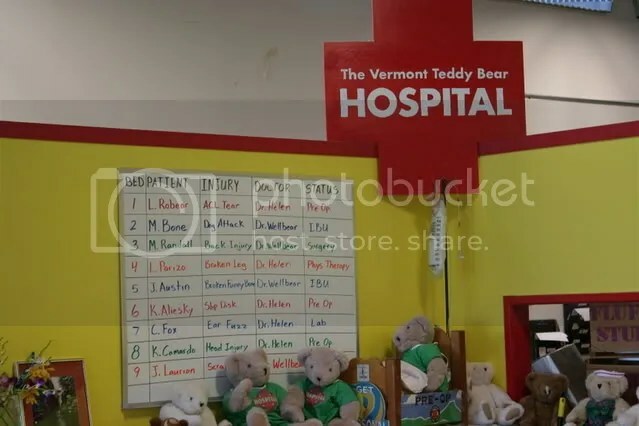 You can pick up VT Teddy Bear coupons for $5 off purchases (of some amount I don’t remember) at any nearby tourist center. You can also print them out from their site if you go to the tours section. Actually, we found ours at Ben and Jerry’s in a Visitor/Tourist stand they have outside near the playground in the back. They’ll only let you use one per purchase. I gave one to someone else who was checking out. So, grab an extra to share. True to VT conservation style, VT Teddy Bear has found a way to reuse things. During the tour, you’ll get a “button bear” to hang on the tour button/pin they give you when you pay for your tour. 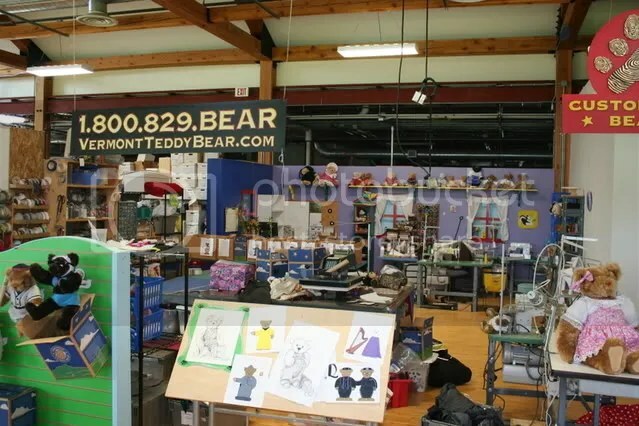 The “button bear” is a bear shaped cutout made from leftover fur that came from the press that cuts out all the bear pieces. This is the 3rd press we’ve seen (printing press in Mystic; cider press in VT) and they all work the same way. Cool. I think the best thing about this tour was being thrust into the gift shop to both enter and exit. Yep. You heard me right. It was cute and fun. Just don’t tell anyone I said that or I’ll claim I was in there looking for a broom to go with my pointy black hat. To quell total cuteness…I bought DS#2 a white bear whose face pulls off to reveal a green alien beneath. Now that rocks. Ahh... Alien Bear... totally non-cute.